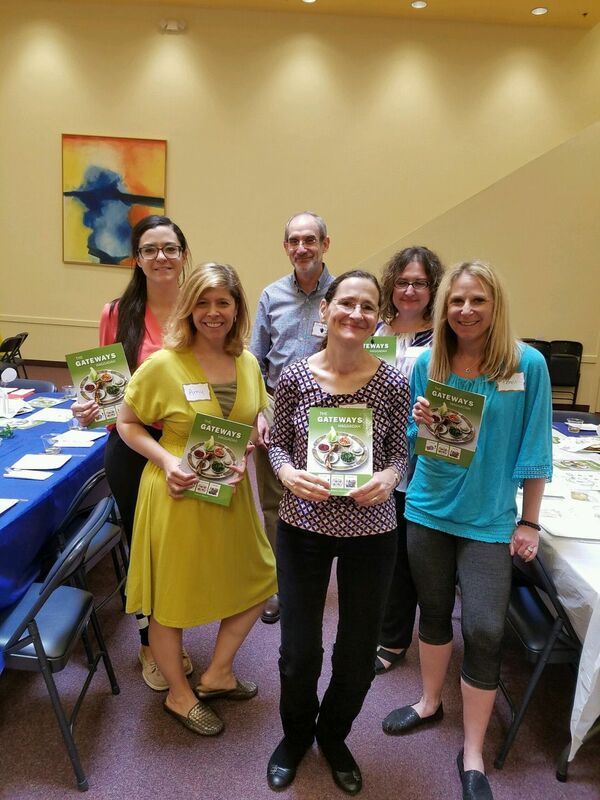 From left, Rachel Corcos, Amy Hummell, Rabbi Michael Wasserman, Rabbi Elana Kanter, Penni Golub and Jill Wilson hold copies of The Gateways Haggadah, which adapts the traditional seder for individuals with special needs and their families. Rabbis Michael Wasserman, left, and Elana Kanter hold up visual cues during the Special Needs Community Model Seder at The New Shul in Scottsdale on March 26. Two weeks before Passover, Rabbis Elana Kanter and Michael Wasserman of The New Shul were leading a model seder – a very special one, using a brightly colored, easy-to-hold Haggadah with visual images. It’s the second year that Gesher Disability Resources (formerly Council for Jews with Special Needs) has hosted the modified Passover service and kosher lunch. “As a parent of a special-needs individual, it was most heartwarming to be invited and most welcomed to celebrate Passover with our son; listening to him participate, feeling good about himself and sharing the joys of the Passover seder,” says Jennifer Feferman. Other participants were also appreciative of the format that granted flexibility and the ability to attend the seder as a way to socialize with other families, while keeping up with the holiday tradition. Gesher Executive Director Amy Hummell applauds the combined efforts of a team of volunteers and Gesher’s staff to plan the Passover celebration. Gesher Program Coordinator Rachel Corcos organized the event under the direction of the volunteer chair, Penni Golub, as well as Jill Wilson, Gesher’s director of education and programs. Becca Hornstein, who co-founded the agency in 1985 and currently serves on the board of directors, emphasizes how beneficial it was to have a multi-sensory seder experience and use the special Gateways Haggadah. “Showing the Passover story through actions and a hands-on experience is a great way to present this to children and adults with intellectual challenges and limited reading abilities. And the Haggadah comes to us from a group similar to ours,” says Hornstein, referring to Gateways, the Boston-based agency that provides special-education services to enable students with diverse learning needs to succeed in Jewish educational settings. The Special Needs Community Model Seder, free for attendees, was funded through grants. Last year’s seder received its funding from the Jewish Women’s Philanthropy Circle of Arizona. This year, Gesher used funds received through Arizona state income tax credits, as a qualifying charitable organization. And Hummell is excited to announce that Gesher has been awarded a grant from Jewish Women’s Philanthropy Circle of Arizona for the 2018 Model Seder. Kathy Shayna Shocket is a freelance reporter and writer based in Phoenix.